Wax nostalgic about and learn from the history of early electronics. See articles from Radio & Television News, published 1919 - 1959. All copyrights hereby acknowledged. During my daily technical headlines search, one of the websites I regularly visit is Radio Ink. As a lifelong fan of over-the-air broadcast radio (and TV), it is interesting to see what trends are playing themselves out. OTA broadcasting is struggling to survive in the modern world of Podcasts and Internet streaming broadcasts; indeed, I do a lot of my radio listening via the Internet because the local stations don't provide what I want. At least I can watch the local news on TV in the evening using just a simple inside antenna. The Big Media types are involved in a major lobbying effort to mandate FM radio receivers in all cellphones, which of course is a prime example of corporate chieftains using their financial might to pay off politicians for something that the rest of us will ultimately have to pay for. Radio's early days faced no such dilemma. People the world over were excited about the advent of radio and eagerly awaited their favorite broadcasts each day. Televisions were mostly for the 'rich,' but most households could scrape together enough cash to buy or build a radio receiver. 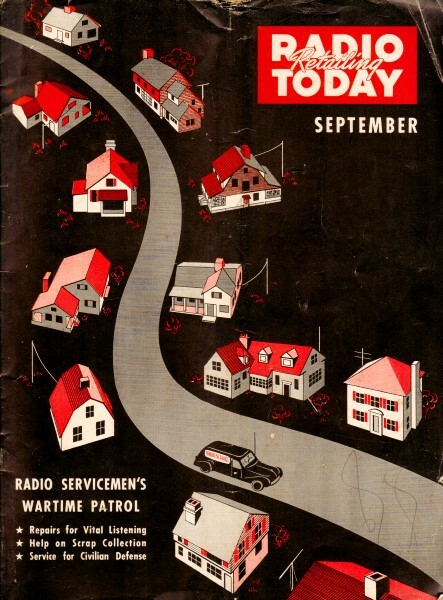 This article from a 1942 edition of Radio Retailing Today gives a rundown on broadcast radio history and growth, along with major events and technology milestones, from 1920 through 1942. 480 Lexington Ave., New York, N. Y. In a rapidly changing field like radio, readers naturally look to our pages to reflect radio's varying trends. During the past few years the editors have repeatedly called attention to the increasing applications of vacuum tubes and amplifier equipment in fields outside of space radio. These uses have come to be known under the broader term of "electronic" applications. Today, tubes find uses everywhere in industry, business, communications, therapeutics, and scientific research. Maintenance and servicing of these opens wider opportunities for local radio men. For many months the editors have sought to keep radio readers in touch with these new electronic developments through our own pages. Looking back over the last two years, many articles and many columns in this magazine have been devoted to describing these new electronic uses. But now that the electronic field is receiving new and tremendous impetus under the drive of war, it becomes apparent that the electronic industries are too vast and important to receive only incidental or departmental attention in the pages of Radio Retailing Today. Of course, in duty to our radio readers, Radio Retailing Today will continue to treat of electronic servicing as an opportunity for the local serviceman. Radio Retailing Today will continue to interpret electronic devices and circuits in wide use, to help servicemen do a good job when called into this new field. But to serve the great electronic groups now rapidly growing up, your publishers announce a new magazine "Electronic Industries" to appear next month, to treat fully of electronics in all its aspects - manufacture, applications, communications - design, production and use. Page 48 of this issue, describes this new magazine further, and interprets its relationship to the field of Radio Retailing Today. Every minute of production action is for us. Every minute of non-productive time counts against us. It is the job of everyone of us to see that our time counts for US and against Hitler, Hirohito, et al. And to only a lesser degree, the same applies to every dealer, every serviceman, every business man, who finds the conduct of his business complicated and jeopardized by our War Effort. In the solution of your own problems, too, time is important,-for time is slipping fast away. It's up to you to make every minute count for you. Things will not get better by themselves. Your action is needed-today - and every day. Your wartime tasks are never done, so long as war clouds darken our horizon. 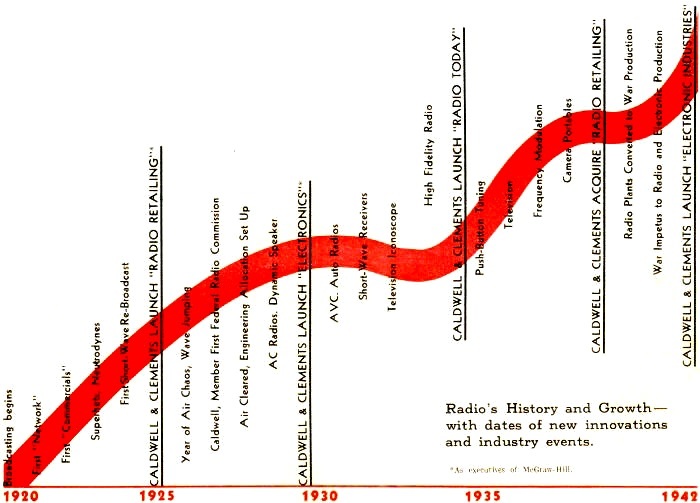 Radio's History and Growth - with dates of new innovations and industry events.